Tonight I’ll be reading at a special annual event to honour mothers. Walking in My Mother’s Shoes involves musicians, visual artists and writers, all contributing their unique talents. 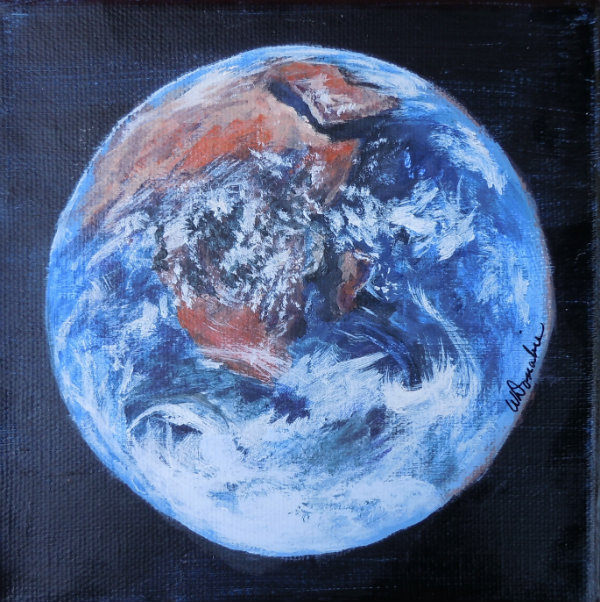 In addition to my written piece, I created the painting, Mother Earth – View of Africa, (featured above) for the event. This year as I thought about what to write for Walking in My Mother’s Shoes, I didn’t consider human mothers. Instead I turned my focus on the mother of us all, Mother Earth. The concept of Mother Earth is common to many indigenous people. She represents fertility, presides over planting and harvest and in some cultures controls earthquakes. Algonquian legend says that “beneath the clouds lives the Earth-Mother from whom is derived the Water of Life, who at her bosom feeds plants, animals and humans” (Larousse 428). 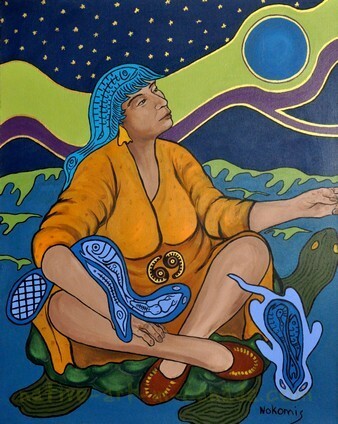 (8) She is also known as Nokomis, the Grandmother. From the website, greekmedicine.net I learned that the first Greek god was actually a goddess. She is Gaia, or Mother Earth, who created herself out of primordial chaos. From her fertile womb all life sprang, and unto Mother Earth all living things must return after their allotted span of life is over. We call our planet, Mother Earth, but how does this relationship actually play out in our lives? In what ways is she like those women we call, Mother and how does our treatment of her compare? Do we recognize Mother Earth as a sentient being or simply as a thing we live on that we only feel obliged to take care of – for our own self-preservation? What could it mean to walk in her shoes? Mother Earth, like our mothers provides us with all that we need – air, food, shelter and physical touch – the most basic human needs. If we pay attention to her, we can learn from her – through her changing seasons, movement of weather systems, and behaviour of wildlife. Our own native people share with us what Mother Earth teaches us. From the rock we learn faith, wisdom, strength and endurance; from the trees honesty and uprightness- as the sap flows through them, so must honesty flow through us. When we trod upon the grass, it bounces back teaching us to be resilient, kind to ourselves and others. And animals provide the greatest gift and lesson. They give us their lives – so we may live. In these ways, Mother Earth teaches us to be human. As her children, our job is simple – take care of her. Many cultures still honour parents but in Western society we are less inclined to respect and care for our elders. Perhaps this is why we have begun to so easily take Mother Earth for granted. We think of her simply as rock, water and air – a place filled with abundance for us to exploit until there is nothing left. Some of us treat our mothers this way as well. Taking and never giving, expecting everything to be handed to us. Human mothers often put up with this behaviour for endless periods of time. They continue to forgive and forget. But will Mother Earth do the same? As we strip her of her wealth without putting anything back, we are most assuredly killing her and eventually all life on the planet. So, how can we have a relationship with a huge chunk of rock, water and air? Well, let me ask you this. 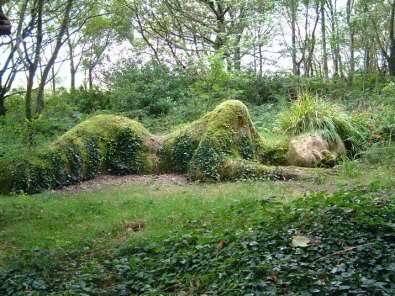 When was the last time you took a moment to listen to Mother Earth? If you’re like me you don’t do this often enough or perhaps you’ve never done it at all. When I do, here is a little of what I experience. While walking through the forest, I feel her support beneath my feet as she responds to each footfall. Feel me, touch me, embrace me, she says. Her scent wafts through the air filling my nostrils with the living smells of the earth, water and plant life. Breath deeply, I hear her say, fill your body, heart and soul with my abundance. From quiet lakes, gurgling brooks, rushing rivers, roaring waterfalls and mighty oceans, I hear her enduring heartbeat. She tells me, We are one, each a part of one another. What effect one, effects all. Her voice travels on the wind, through the calls of birds; her messages are seen in the movement of wildlife and heard echoing through her canyons and valleys. Know me, know your brothers and sisters. Care for each other. Everything you need is here for you to use but not abuse. This is my experience; it’s a spiritual one. My Mom and I shared a spiritual connection as well; I’m sure many of you do with your mothers. But just as each child relates in a different way to his or her mother, your connection with Mother Earth will be unique. I encourage you to develop a relationship with her, if you haven’t already. She’s a wonderful companion, wise advisor, an unconditional friend and . . . we need her. One question still remains. How do we walk in Mother Earth’s shoes? I think that’s quite simple really. Just as human history teaches us what works and what doesn’t, Mother Earth does the same. If we take the time to examine how nature functions and learn to live by her rules, if we start putting back and not demanding more, we just might have a chance of saving her and saving us. This is how we can learn to walk in her shoes. Tomorrow is Mother’s Day, and while we focus our attention on the mothers who birthed us or those who took us under their wings in some other special way, can we each take a moment to think about the mother of us all? What better time than Mother’s Day to pay tribute to Mother Earth. She who provides us with a home and fills our every need, from the air we breath, the water we drink, the food we eat, the clothes and buildings that protect us – all these begin with her. She is nature in all its forms. Just as we thank our mothers for bringing us into this world, for caring for us, nurturing us and supporting us, Mother Earth could use a little appreciation too. How can you commit to being a more devoted son or daughter? Happy Mother’s Day to each mother here tonight and a special Happy Mother’s Day to our Mother Earth! Thank you. ← Who Will You Honour on Mother’s Day? Wish I could be at this special night.Have a happy Mother’s day. What a lovely way to spend Mother’s Day. We always take from either from our MOTHER or MOTHER DIVINE or MOTHER EARTH from our birth to death. Indeed a very nice write up. Thank you for visiting and liking my post, Mother Earth’s Day? Interesting the synchronicity….I read your piece on Mother Earth. Seems we were getting the same message….Hopefully the message is being heard. At least we have tried and tried our best. Let’s see affect on the ground. Last night when I read my piece I received great feedback…It hit home with many gathered at the event… Let’s hope our words have the power to bring about some changes…..